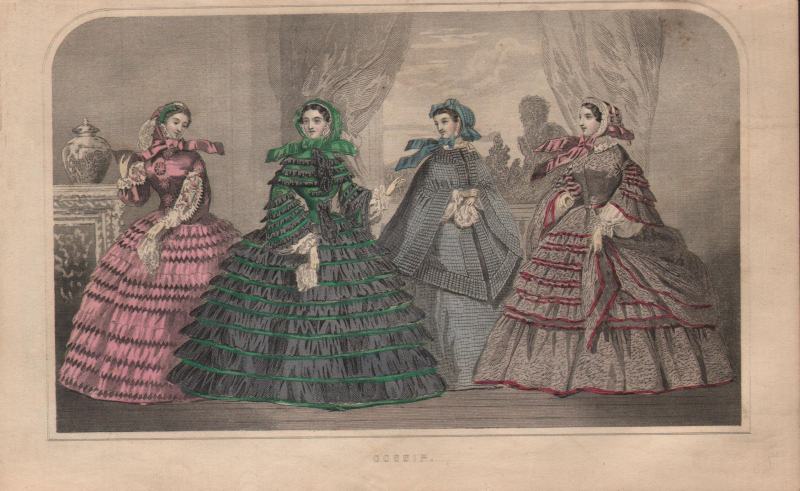 Four ladies show off their fashionable attire in this plate from an 1860 fashion magazine. Godey’s was known for showcasing fashionable attire for the entire family but they often featured lady’s apparel. This fashion print was published in 1860 and is a fine example of Civil War era fashions. Apparently ruffles were quite popular as three of the lady’s dresses have rows upon rows of ruffles. The one lady, not wearing a ruffled dress, has horizontal stripes instead. All are wearing white gloves and bonnets with ribbons that match their dresses. The title of this vintage image is “Gossip”. I guess these fine ladies were meeting in one of their homes to exchange gossip. Though, it does seem a bit odd, that they are all standing and still wearing their gloves if they are visiting to exchange gossip.